This week's highlight was definitely the last day that Pia was with her father. 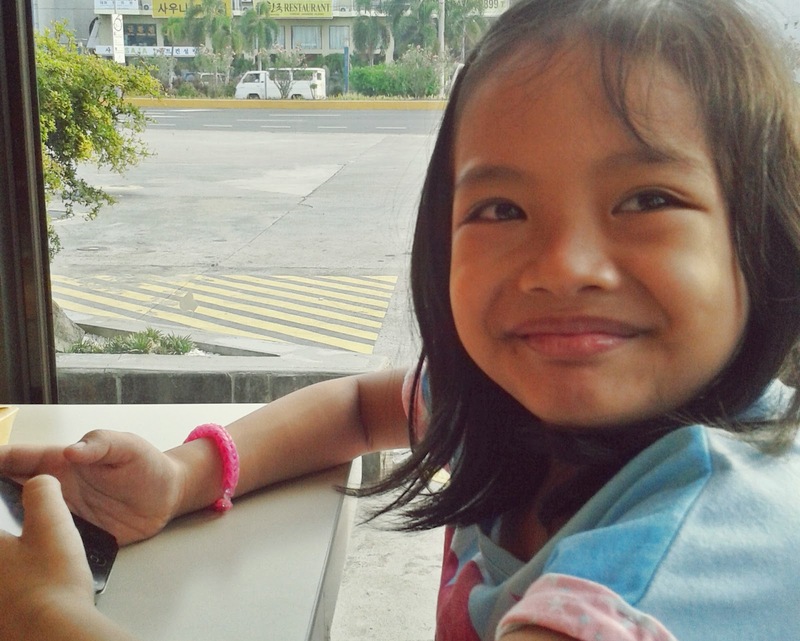 This was taken in a Jollibee store somewhere going to Manila. We had a quick breakfast before hitting the road for a long-I-can't-sleep-'cause-I-need-to-entertain-the-driver-who-happens-to-be-my-husband journey home. I think this sunshiny girl didn't know that seeing her soldier dad again might take longer than the usual 'cause she didn't feel a bit sad even after he left the house. 8 days after, I can say it's different now. She calls him without my knowledge (yes, she knows how to!) and always texts him, too. Her favorite thing to send him? This, in verbatim: "I.love.tatay. :*"
Awww that is so so sweet of your girl :) love her smile, she looks lovely!